Viewing topic "Looking for help in English dictation"
I’m a Chinese. I’m very interested in the new YAMAHA MOTIF XF. and I want to add a Chinese subtittle to the official video demo. But I myself can’t understand some of the words in the video since my listening ability isn’t that good. Will someone help me with my dictation? Thank you. just correct it according to the video. the following are my dictation. need correction. It was recognized as the best sounding, top selling and most requested music workstation on the market. The motif is the most widely used keyboard in professional studios and on stages. But the motif is more than just a keyboard. It’s become the center of online community of end users, sound programmers, part? support forums with custom content at motifator.com that is expanded into the most vibrant online music production community on the planet. The Motif brings new life into live performances with its functionality and internative?? control. In music creation, the Motif not only comes with its own sweet?? of generation features, it also offers a system for integrating these capabilities: the software applications. The motif XF is the combination of a decade of development and research. The ground breaking possibilities that open up with the flash board option provided? a solid platform for years of future expansion. The Motif XF contains incredibly realistic acoustic instruments fainted? sense and hip-pop sounds all today’s top producers using. 741 megabyte, the XF’s wave rom is the largest internal sound librity? ever created in the workstation keyboard, twice the size of the motif XS and nine times of the size of the original Motif. Detail digital recreations of two YAMAHA grand pianos: a nine foot CF3 and seven foot S6 with only the acoustic piano manufacturer? could achieve satisfy even the most demanding players. And a popular FSX keyboard on the motif XF 6 and 7 and the balanced hammer action keyboard on the motif XF 8 let you express your passion for playing. Perfomances that combined 4 voices and 4 intelligent appeggiators lets you play many different songs of music in an instant. Intelligent arps, respond interactively with your play instantly let you create backing tracks. And the YAMAHA’s internative? direct performance recording feature lets you record these perfomances and keep them forever. 16 track recording with a 128 maga ram of sample standard lets you load new sample libraries, add vocals and guitars to your motif recordings ,slice audio loops, create new grooves with real time loop remix, switch between loop-style pattern and linear song modes. Direct? USB recording and playback lets you record your final song mixes as CD quality wave files to any connected devices? memory device. Or play wave files created on the computer back on the XF. You can install up to two gigabytes of optional flash wave? memory two slots accommodate for 512 MB or one gigabye YAMAHA flash boards?. Because this is flash memory, you only have a load a sound once. After that, it’ll always be your Motif every time you turned it on. These samples could be some of the new most Motif voice libraries and the best selling VST sample library developers in the business including Garritan, Sonic reality, DCP and digital sound factory. Or they could be your own samples, background vocals ?? you need to take on the road or your favorite sound you can verted? to your motif format. Whatever you sample, now it’s just easy to roll a ?? Imagine a fully customized motif XF, 3 gigabytes of sounds, ?? ram and flash instantly available at your fingertips. The XF comes with the improved user interface with many user requested features like tap tempo, dramatis? mix mode and auto mapping of samples. Plus the new customized O UI? Fascinate? your choice of color and positioning of key displays. Part of YAMAHA’s ongoing commitment to new content has been the motif developers’ conference where independent sound designers can learn, exchange ideas, get new tools and develop new third party sound libraries. What’s incredible about the Motif XF is that we now have two gigabytes of flash ram available. This really allows an unparalleled level of customization. You can truly make this instrument your own. You can truly give it your own personality. DAW integration through remote control VST and studio ? and extentions let you see ? motif with any DAW software.
? ?ability through standard equipped USB and internet and FW16?? option lets you connect your computer and take advantage of all processes available on the sysystmes? And you won’t be alone. A global network of motif sound programmers and software application developers have created the million plus post online community at motifator.com. The support is available anywhere in the world and 24 hour??. With the release of the XF, there is a whole new range of third party sound applications from all over the world including mo? sample, motif wave form melter? arp manager, motif creator and total editor, a complete package for editing anything on the motif from voices?? to masters. New and exciting voices and sample libraries have been created and released all the time. 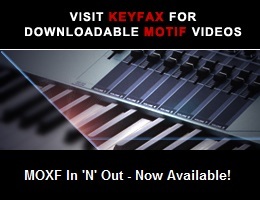 The next generation Motif XF builds on the decade long heritage of Motif adding the most requested features from XS users and breaking new ground with the new flash memory expansion capabilities, the ..standard for keyboard workstations for years to come. It’s only the beginning of the latest chapter in the Motif legend and will last for years in the news?. it’s easy to just roll you up. As for an artist mentioned on 00:27, I just don’t know who he/she is, sorry; tried to search but to no avail. Hopefully someone else will offer some help here. The correct link to the video is http://www.motifator.com/index.php/videos/view/inspiration_comes_in_a_flash BTW. At 27 seconds the artist is Carrie Underwood. She won the fourth season of American Idol and is a very big country star in the US. Ah. There is no way to tell that Jonathan Hamby has any connection to Carrie Underwood when you look up yamaha.com/artists. This page http://www.yamahasynth.com/jp/library/motif_artist_j/ is much better, unfortunately there is no English version.